According to the Tweets from the public comment regarding the rezoning of Sunset Park, it seems like a done deal. 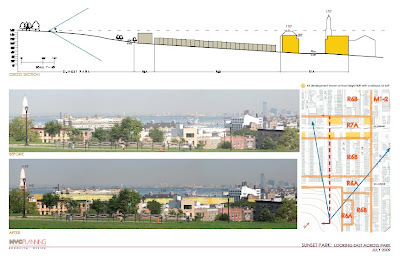 What will the views in Sunset Park be like after the rezoning becomes (re)building? This was sent to me by a reader; it's available as part of the rezoning proposal. It's very cool, and it certainly makes the rezoning seem friendlier. However, local activists aren't feeling too friendly when it comes to the rezoning. See the response from the Friends of Sunset Park below. Click on the images to enlarge them. With all the empty warehouses the city wants to approve new structures. Why? BViB- Somehow, the following 2 items were left out. Could you add them to our response. Tks. * the directional perspective cited on the lower, right hand of the page says, "SUNSET PARK: LOOKING EAST ACROSS PARK - JULY 2009." Shouldn't any one working as a surveyor or planner know the difference between East and West? Last we heard, New Jersey is West of Brooklyn. It's hard to consider the validity of the data presented when such basic, general knowledge has eluded the professionals involved. * too bad you weren't sent the accompanying studies/projections looking West/Southwest and South from Sunset Park. Those projections would have shown that the present view in those directions would disappear if 5th Avenue from 44th-65th Streets is re-zoned as proposed (see attached proposed re-zoning map from the NYC Planning Department). Can developers purchase air rights from other building owners and build a tower higher than 8 stories in the new zone? Vanessa- I believe all the warehouses in sunset are industrial zoned. The rezoning in question at large is residential/commercial. Correct me if I'm wrong. I see no harm done to our view. Anon, no, air rights cannot be transferred under the new zoning. The cap is at height and bulk. Period. Yes, the area from 3rd Ave to the water is 90% industrial and was not affected by any of the rezonings. CPC chose to stay away from them as their developmental impact is low AND anyone wanting to convert manufacturing to residential will have to apply for a variance, which has public review and input at the CB level and the BSA.